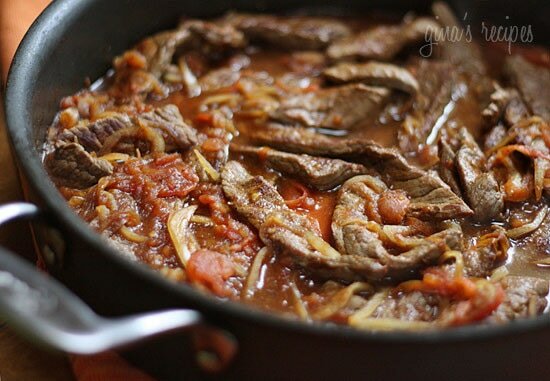 Beef lovers, you’ll love this quick Colombian steak dish cooked with onions, tomatoes and cumin. 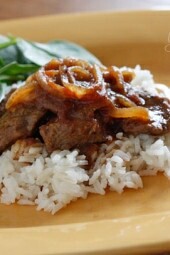 The onions and tomatoes create a flavorful sauce which is wonderful served over rice. Add a salad and you’ll have a wonderful meal for under $10. If I had to describe Latin cuisine in one word it would be flavor. My friends and family love when I cook some of the Latin dishes I grew up eating, for me those dishes are my comfort food. You’ll find variations of this recipe in different South and Central American countries and regions. 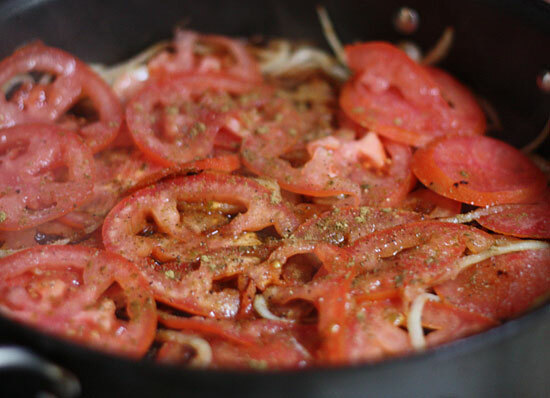 Some finely chop the tomatoes and onions, some use scallions in place of onions which is also delicious. As a kid I used to push the onions away, but now I just love them. 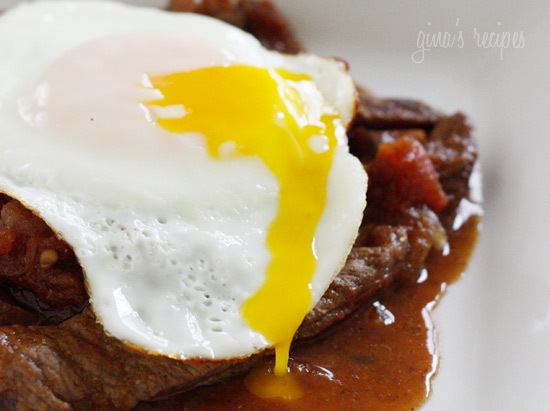 Serve this with an egg on top and it’s called Bistec a Caballo. Have all your ingredients prepped before you start cooking. Sirloin tip side steak is an extra lean steak with very little marbling. This cut usually needs to be marinated or cut very thin so that it won’t be tough. Here is a great reference I like to refer to often for the 29 lean cuts of beef. If your budget permits, buy grass fed beef which is lower in saturated fat and cholesterol, and higher in omega-3 fatty acids, which are considered heart-healthy. Heat a large frying pan until VERY HOT. Add 2 tsp of oil then half of the steak and cook less than a minute on each side. Set steak aside, add another teaspoon of oil and cook remaining steak. 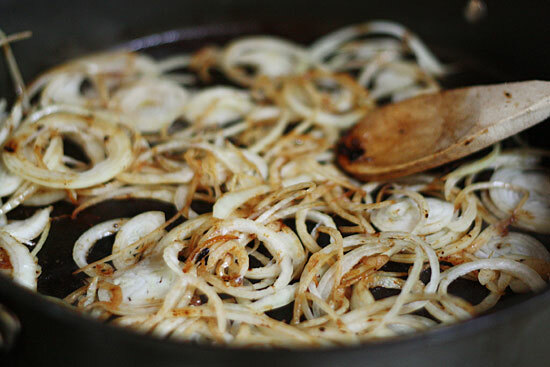 Reduce heat to medium, add another teaspoon of oil and add the onions. Cook 2 minutes, then add the tomatoes. Season with salt, pepper and cumin and reduce heat to medium-low. Add about 1/4 cup of water and simmer a few minutes to create a sauce, add more water if needed and taste adjust seasoning as needed. 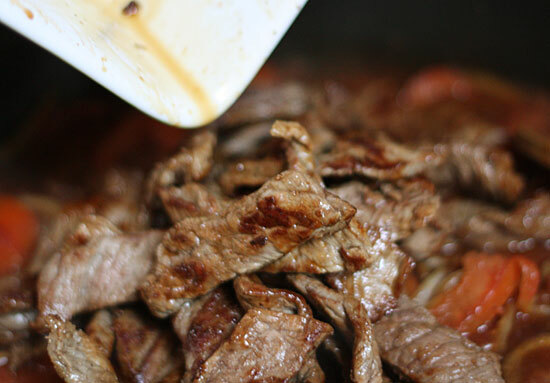 Return the steak to the pan along with the drippings, combine well and remove from heat. Serve over rice or for a low carb option with a sunny-side up egg on top. I made this tonight with round steak. It was delicious and easy to prepare. It is very good and easy to make. This looks great! I’m making it tonight and am very excited. I love trying new recipes from other cultures and although I’m not on weight watchers, I do insist on eating very healthy and I love how you’re helping other people get healthy too. That’s awesome! 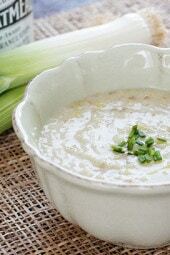 I am planning on serving this over riced cauliflower to stick with the food combining guidelines, and even lower carbs. Thank you! I’ve made this at least 10+ times and it’s fantastic! So easy to make during the week and loaded with flavor. I’ve served it over rice, with just the fried egg, in hoagie rolls as a steak sandwich, I’m always switching it up. Your recipes are absolutely amazing!! Can I use flank steak for this recipe? Hey, this looks awesome! My husband is not a fan of tomatoes do you think a sauce or some tomato paste would work in this? thank you for all you do! Made this friday night. My steak wasn't the most tender, but it was still delicious. We both loved it! I made this twice last month and plan on making it again tonight for guests!! My 5 1/2 year old loves it, as does my husband. Thank you for sharing so many wonderful healthy recipes. Have you or anyone ever tried this over a charcoal grill? Soy Colombiana y me ha encantado tu receta. OMG! Made this last night, it was amazing. I am Puerto Rico and I love my latin food. I paired it with the baked season fries. SO GOOD. Glad a friend told me about this site. I can see myself using alot of these recipes. making this tonight for mothers day, pairing with arroz gandulies, is that a good Fit? I JUST found you about a week ago, and I'm addicted!!! I made this recipe tonight for my two guys (my husband and 9 year old) and they both LOVED it. I could have eaten way more than my one serving, but that one serving was so filling!! Thank you thank you thank you for what you've done at making healthy eating so much easier and enjoyable! oh my this is delicious! it was so simple and quick! the brown rice took longer to cook ha. the egg looked so good i had to try it so i probably ate too much but it was worth it. delicious! Preparing it right now!!! Smells delicious!!! Thanks!!! I made this a couple of nights ago and it was absolutely amazing. I added mushrooms and used stew beef instead. Even with the variation it was great and what's even better is that my husband loved it. Today I am making it again for my in-laws as Sunday dinner, instead I am making it in a crockpot – I hope it comes out as great as the first one!!! Can I use eye of round steak for this? Just made this and it turned out GREAT! I like things spicy so I spiced it up a bit. Hubby loves anything in a tortilla so he added black beans and turned it into a burrito of sorts! also very yummy! thanks for the recipe! Erica, so glad you can make some of your childhood dishes! And I really glad you all liked it! I noticed you said you had family in the DR, my husband & I just vacationed there for our 10 year wedding anniversary & loved it & the food. I was wondering if you might know, the resort we stayed at served a kind of mushroom salad (I ate it off the buffet everyday & it was so delish) I think it had mushrooms, onions & peppers & they had been marinated. Do you have any idea what it was, I would love the recipe. We don't eat a lot of meat but made this on the weekend "IT WAS GREAT"!! I substituted dry garlic for fresh which was softened in the onion just prior to the tomatoes going in. Served with an egg on top and cooked spinach on the side (no rice)…it's definitely a keeper in my recipe box! I love this dish & make it often. It's so easy & I often have leftovers in the morning with the egg you suggested for a low carb alternative. Thanks for all of your recipes! I've always wanted to cook homemade Colombian meals that I grew up with for my husband but I never learnt exactly how to make; it especially healthy. I made this last night and he thoroughly enjoyed it. I enjoyed the smell that filled the house, it brought back so many wonderful memories. This will definitely be put on rotation. 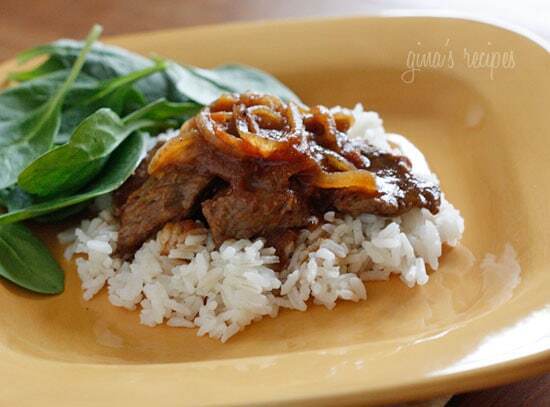 White rice cooked with salt is perfect with this, the sauce has plenty of flavor! I am making this tonight for my boyfriend! It sounds sooo good, I can't wait for dinner! I was wondering if there is a rice recipe I could use so it is not made with plain rice. Or do I not need a flavorful rice since the dish seems so tasty?? Thank you Gina for this site, I am so inspired and excited about cooking again! My husband adores this! He is from Honduras and Hondurans love cumino. Like you, we also go heavy on that spice. We buy it fresh ground and it makes a difference in taste. Thank you!! Where is the sancocho ? I am from Colombia and Sancocho is my favorite. thank you for all you do, it is making my WW life style much easier. These are so good with the marinara sauce! I'm so glad you liked it!! I love this dish! My husband and I LOVED this recipe! It was so easy to make and so full of flavor! It is very rare that my husband likes anything I cook, and he raved about how good this was. Thanks for sharing! Made this for dinner last night with rice. My 5 yr old cleaned her plate! Thanks for sharing all these wonderful recipes. Ok! I have a lightened up Sancocho, aji picante, I'll work on some more soon! Hey, my family is all from Colombia but they never write down their recipes! Ugh. I'm glad I found your blog thorough Pinterest!! I love this meal. My Mom makes this all the time. so i grabbed the wrong steak at the grocery store and didnt know it until i came home (new york loin)..i went with it anyway and cooked it as instructed, and booooy was it delicious!!!!! I cooked this last night and it was amazing. I served it with white rice and your avocado salad and everything was ready in 45 minutes. This brought back memories of summer vacations spent in DR.
My picky three year old daughter said that it was good and finished all her food which was a great compliment considering that she thinks all my cooking is "yucky". Thanks for all the Latin recipes. Looks delish! I didn't go shopping this week but have all these ingredients on hand. Going to be tonight's dinner! I am picking this from my teeth as we speak. It was delicious, fresh, quick, and very easy. I will definitely be putting this into my dinner rotation. Thank you! Beth – Sure, any thin steak would work so you can use a minute or pepper steak. I would LOVE to make this, but I have a beef question. We keep kosher, and it's pretty $$$ to get red meat. The more affordable kosher beef selections at the supermarket are minute steak, pepper steak, cube steak. Would one of these work in this recipe? I just googled 'cuminto' as I didn't know what it was. Bad idea!!! Okay…I made this with chicken AND with tofu yesterday. I have a friend that is vegan and she absolutely loved it. It was my first time making anything with tofu…I marinated the tofu and the chicken in the GOYA mojo for about an hour first. I added some fresh garlic too, and cooked the chicken a little longer and it just fell apart. After reading the reviews, I was heavy palmed with my cumin, we like flavor!! Thank you so very very much for your ideas. I made this a couple weeks ago, I loved it. My son is not a great big "beef" eater so I'm making it tonight with chicken, hopefully it'll be just as good. I think diced tomatoes with green chiles would be fabulous!! It would give it a Mexican flare! I wonder if you could used the diced tomatoes with green chiles. This was sooooooo good!I now have made 5 of your dishes. I love this for breakfast!! But with rice. I have been a fan of your blog since last year. I am on WW and I have a long way to go to get to my goal weight but I love food and I love to cook so I love that you make so many different kind of dishes. I am making this dish as we speak. The sauce is delish! I am going to make some yellow rice to have with it and some kind of green veggie on the side. I also plan to save a serving to have as a breakfast during the week with the egg on top served over potatoes o'brien. I made this for dinner tonight. It was just fabulous!! I love steak, and I loved cooking it this way. It smelled amazing when it hit the pan! I made this for dinner last night and had roasted carrots and celeriac, steamed green beans and broccoli with it. It is lovely, really taste and flavoursome. 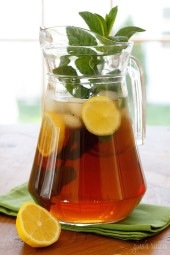 Absolutely amazing and SUPER EASY TO MAKE! My husband loved it! Karen – now that's a first over noodles! Glad you guys enjoyed it. Fresh tomatoes are wonderful, I always buy them for recipes. They really do make the dish taste fresh. And this recipe couldn't be easier! I just made this tonight, it is so good! A few simple ingredients and so quick to fix, I couldn't ask for more! I made it with fresh tomatoes and that's how they made this dish taste, fresh. I have never cooked anything with fresh tomatoes and it made a big difference. I plan to keep this dish in my meal rotation! Thanks for posting it for us! Had this for dinner tonight and served it over yolk-less egg noodles and topped with the sunny side up egg . . . Yummo!! And my husband loved it as much as I did. Thank you Gina! Thanks Lyn for the vote and shout-out! Maranda, yes everything is better with an egg! Raquel my husband just informed me that he started his low carb diet today so I guess that's bye bye pasta! My husband made this for me this weekend and it was fabulous. Wow Gina!!!! 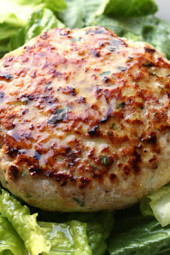 This was a great first recipe to start my low carb diet (just started today). The flavors are tremendous and it is very filling!!! I will definitely be making this again soon!! Wonder how this would taste with chicken? How about over spaghetti squash? Mmmm maybe I'll try that this weekend!!! deliciosos!!!!! I certainly be sure to try this one! Wow, I can’t wait to try this recipe. I love the egg on top. I haven’t had that for a very long time. Years ago an old boyfriends mother used to make different recipes for me and she always put an egg on top. I loved it! Sounds silly but I am very excited about this recipe. I also love that you used a grass fed steak. It’s perfect for me because I only eat grass fed beef. I know sometimes it’s hard to find grass fed beef so if you ever need a place, I order mine from La Cense Beef and they deliver it to me. It’s very convenient. Thanks again for this dish!! This looks delicious. Heading out now to pick up the ingredients. Wow! This looks amazing! And EVERYTHING is better with an egg right??? Yum! Nominations are open for Saveur's Best Food Blog Awards. If you haven't voted already please go to this site and vote. I believe Gina should be recognized for her excellence. Gina, you have made weight loss painless for many of us. Your recipes are delicious and the photos are flawless. Thanks you very much! Monica, one can should be ok or maybe 1 1/2. No marinade needed here, just salt and garlic powder. Magda- funny how so different countries have different names but lomo saltado sounds yummy!! Anything with Peruvian in the name makes me hungry! I'm so happy you like the variety in my recipes, I love variety and would het bored eating the same type of food all the time. For me, mixing ethnic dishes throughout the week couldn't make me happier! This is very yummy waiting for another one dish. I've been following for a while and I just wanted to finally stop in and tell you how much I appreciate your blog! Every recipe is delicious, the scope of what you put up is commendable (there's something for any culinary mood I'm in), and I love that you don't rely on the use of substitutes such as Splenda. Thank you so, so much for putting so much work into this! I had this for dinner with rice and brocolli. Outstanding. Hi, it's me again. 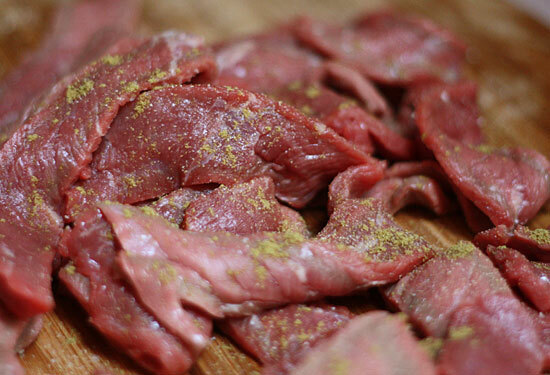 Sorry, I forgot one more question – what would you marinate the meat in? Thanks again for everything you do. You're making my WW journey so much easier. Hi Gina. Silly question. I saw you responded above to a poster who asked if you can use diced tomatoes (and the juice as well) – which you said yes. My question is – how many cans of diced tomatoes? I have 14.4 oz cans at home. Would one be enough or do you think 2? Susan, sorry if I confused you what I meant is to either marinate or cut very thin. we love skinny – aww cute name! So glad you liked it!! Those of you who don't like cumin, why not add spices you do like. I can see chipotle chile powder working really well or your favorite steak rub. So I saw this last night on my way out of the office, and had to make it immediately! IT WAS AMAZING, so rich and, but without the heavy feeling you get after actually over-indulging. I got my entire office on the site and when your new recipe e-mails hit all you can hear is "oooh—ahhhh"! Thanks for being you! This looks great. Your into indicates this cut of meat usually needs to be marinated but you didn't comment on marinating in the recipe. Just want to ensure I didn't miss a marination step? Jamie sure why not. Don't drain, use the juice instead of adding water. This sounds delicious. I might make it tonight. Do you think this would work with canned diced tomatoes if I drained them? I should have mentioned I am generous with the cumin!! But add to your taste. Kimberly I cut it myself. Sharpen your knife before you cut or you can put the meat in the freezer for like 10-15 minutes to make it easier to cut. You are SOOOO inspiring! Thank you for creating these awesome recipes! 🙂 You ROCK! P.S. On Weight Watchers for 8 weeks now and I'm down 15 lbs! Thanks for helping by helping me create delicious, low fat options! This looks great! Do you buy your steak cut this thin, or do you cut it at home?